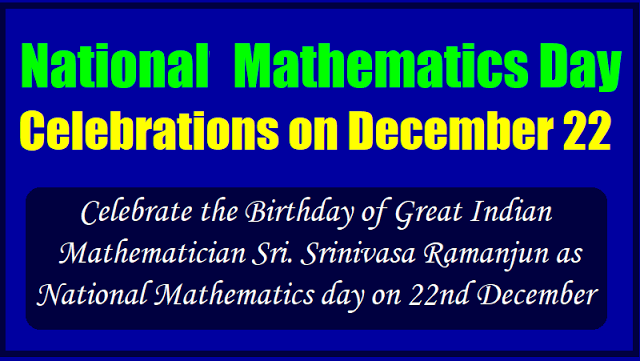 National Mathematics Day Celebrations on December 22, 2018: Celebrate the Birthday of Great Indian Mathematician Sri. Srinivasa Ramanjun as National Mathematics day on 22nd December in all TS Schools and IASEs, DIETs and CTEs as per the SCERT, Telangana, Celebration of National Mathematics day on December 22nd, 2018. All the District Educational Officers and Principals of IASEs, CTEs and DIETs in the state are informed to celebrate the Birthday of Great Indian Mathematician Sri. Srinivasa Ramanjun as National Mathematics day on 22nd December in all the Schools and IASEs, DIETs and CTEs in the State. National Mathematics Day Celebrations on December 22: Every year, the country celebrates National Mathematics Day on December 22 to commemorate the birth anniversary of Mathematician Srinivasa Ramanujan. Born in 1887 in Erode, Tamil Nadu, the story of Ramanujan’s tryst with mathematics is one of the most engaging tales read, depicted and performed through various works of art. With the support of Mathematician Ramaswamy Iyer, he got a job as a clerk at the Madras Port Trust. His breakthrough finally came in 1913, when Ramanujan wrote to G H Hardy. The British mathematician, on realising Ramanujan’s genius wrote back to him, invited him to London. Hardy then got Ramanujan into Trinity College, Cambridge and what began was a captivating saga of success. In 1917, Ramanujan was elected to be a member of the London Mathematical Society. In 1918, he also became a Fellow of the Royal Society, becoming the youngest person to achieve the feat. The London weather and the poor eating habits slowly affecting the health of Ramanujan, and he breathed his last in Kumbakonam at an age of 32. The mathematics wizard made a significant contribution to mock theta function that generalises the form of the Jacobi theta functions, while preserving their general properties. India celebrates National Mathematics Day in memory of Srinivasa Ramanujan: Famed Mathematician Srinivasa Ramanujan’s birth anniversary on December 22 is celebrated as National Mathematics Day. Born in 1887 in Erode, Tamil Nadu, the story of Ramanujan’s tryst with mathematics is one of the most engaging tales read, depicted and performed through various works of art. Dev Patel-starrer ‘The Man Who Knew Infinity’ (2015) was the latest tribute to the mathematics wizard by the popular cinema. It was in 2012 that then Prime Minister Manmohan Singh declared December 22 as National Mathematics Day. Born into an orthodox Iyengar Brahmin family, Ramanujan’s strictly vegetarian diet and frugal eating habits took a toll on the genius’ health in London’s inclement winters where he couldn’t endure the off-shore climate, resulting in his return to Tamil Nadu where he breathed his last in Kumbakonam at a remarkably young age of 32. Ramanujan lived a life that was devoted to mathematics in all its passion. At a fledgling age of 11, Ramanujan began to show signs of an unfolding genius. British mathematician Godfrey H. Hardy was instrumental in supporting Ramanujan’s extraordinary calibre for mathematics. The mathematics wizard made a significant contribution to mock theta function that generalises the form of the Jacobi theta functions, while preserving their general properties. Although Ramanujan received no formal education, by the age of 12, he had mastered trigonometry and developed many theorems on his own with no assistance. He was awarded a scholarship to study at Government Arts College, Kumbakonam, but he eventually lost it due to his abysmal performance in other subjects. He ran away from home and enrolled himself at Pachaiyappa’s College in Madras. Ramanujan devoted himself solely to mathematics but fared poorly in other subjects. There were hard times in the genius’ life as he had no way of supporting himself. Mathematician Ramaswamy Iyer helped him get a position of a clerk at the Madras Port Trust. His breakthrough finally came in 1913, when Ramanujan wrote to G H Hardy. The British mathematician, on realising Ramanujan’s genius wrote back to him, calling him to London. Hardy then got Ramanujan into Trinity College, Cambridge and what began was a captivating saga of success. In 1917, Ramanujan was elected to be a member of the London Mathematical Society. In 1918 he also became a Fellow of the Royal Society, becoming the youngest person to achieve the feat. Ramanujan, however, had difficulty acclimatising in London. The English diet did not suit this orthodox Brahmin eatring habits. He was even hospitalised due to ill health in 1917. He returned to India in 1919 but his health deteriorated. He passed away on April 6, 1920. SCERT Telangana :: Rc.No. Spl./137, Dated:06-12-2017 :: Sub: SCERT, Telangana, Hyderabad - celebration of National Mathematics day on December 22nd- Orders - Issued....... All the District Educational Officers and Principals of IASEs, CTEs and DIETS in the state are informed to celebrate the Birthday of Great Indian Mathematician Sri. Srinivasa Ramanjun as National Mathematics day on 22nd December in all the Schools and IASEs, DIETs, CTEs and Teacher Education Colleges in the State. Therefore all the DEOs and Principals of IASEs, CTEs, DIETs and Teacher Education Colleges are requested to celebrate National Mathematics day in their respective Districts/ Institutes with the following suggested activities. Therefore all the DEOs and Principals of IASEs, CTEs and DIETs are requested to celebrate National Mathematics day in their respective Districts with the following suggested activities. The Activities mentioned above are only illustrative, the Schools, IASEs, CTEs and DIETs may opt for other creative activities also. In order to create interest in and attitude towards mathematics among the student community, prizes and certificates may be awarded to them for participations in the activities. Further they are requested to send the report on the said activities to the Department of Mathematics and Sciences, SCERT by 31st December, 2017 positively. National Mathematics Day in India is celebrated on December 22. It commemorates the birth anniversary of Srinivasa Ramanujan, an Indian mathematician who made significant contributions to several fields of mathematics. The declaration to observe 22 December as National Mathematics Day was made by former Prime Minister Dr. Manmohan Singh on 26 February 2012 at Madras University on the occasion of 125th birth anniversary of Ramanujan. On this occasion, India and UNESCO agreed to work jointly in spreading the joy of mathematics and knowledge to students and learners across the world. An unparalleled genius and a self-taught mathematician, Ramanujan found his true calling in numbers and made extraordinary contributions to mathematical analysis, number theory, infinite series, and continued fractions. His love for maths was so much so that he failed most of the subjects in school. He didn't live long but in his short life he compiled more than 3900 mathematical results and equations, and his discoveries namely Ramanujam Prime and Ramanujam theta inspired further research on the subject. Joint Statement by DG UNESCO and the MHRD on the Occasion of National Mathematics Day: India has accompanied UNESCO since its founding in 1945 on the conviction that peace is built in the minds of people through education, science and culture. Our longstanding partnership is one of values and action. India subscribes fully to the principles of UNESCO, and seeks today to broaden and deepen this partnership, especially in education and science, because we know that these hold the keys to inclusion, innovation and shared prosperity. In the Indian tradition, knowledge is deemed a supreme wealth that increases by giving. It is the greatest gift that one can give, for knowledge brings lifetime enrichment. UNESCO shares this profoundly humanistic vision. All the Organization’s initiatives are driven by the belief that universal access to education and knowledge is the single most transformative investment to empower individuals and nations, to promote mutual understanding and foster world peace. In this spirit and going forward, India and UNESCO will work jointly to deliver programme of collaborative action on education, commemorating as well the pioneering work of two celebrated Indian academics and intellectuals, Ramanujan and Aryabhata, whose contributions have spawned generations of mathematical and scientific research, catalyzing landmark advances over the years. Ramanujan’s contributions to number theory are legendary. His birth anniversary on 22 December is celebrated in India as National Mathematics Day. Aryabhata, who dates back to the classical age of Indian mathematics and astronomy, is credited with the ‘invention’ of the zero, his contributions also spanning an extraordinary range of mathematical fundamentals which are the basis of current major applications and continued research. The gift of a bust of this great mathematician-astronomer to UNESCO will be India’s tribute to the world of mathematics and science. On the occasion of National Mathematics Day 2017, India and UNESCO agree to work jointly in spreading the joy of mathematics and knowledge to students and learners across the world. To this end, Conferences on the “Zero” at UNESCO Headquarters in Paris, as well as at the Indian Institute of Science, Bangalore will be held, bringing together academics, mathematicians and teachers to explore and discuss key associated concepts. Together we will connect research and practice, because it is on the benches of schools that the spark of mathematics is lit in young minds – through innovative teaching and learning, positive role models, and encouraging girls early on to follow scientific pathways.